Rather, the Series B market is worrisome. At the moment, Series Bs are the hardest rounds to raise for startups. The data proves the point. 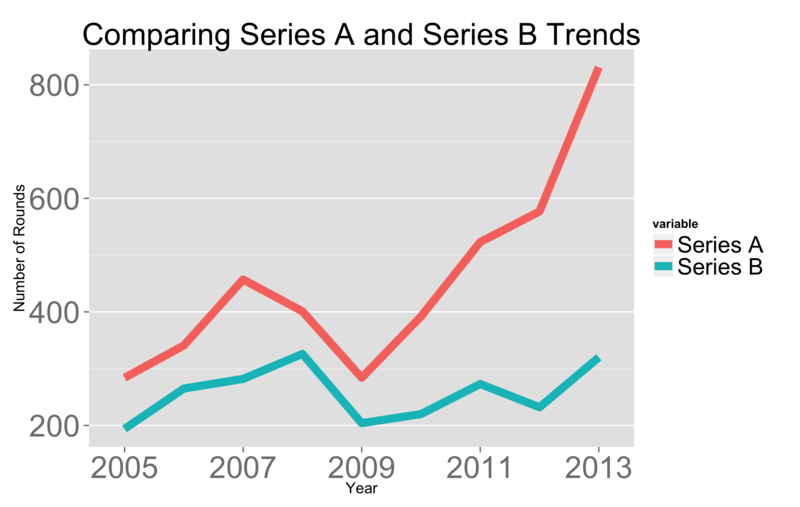 The chart above compares the number of Series A rounds and the number of Series B rounds recorded by Crunchbase over the past eight years. Series As have grown dramatically, by more than 30% per year. In contrast, Series Bs lag behind at 10% annual growth. 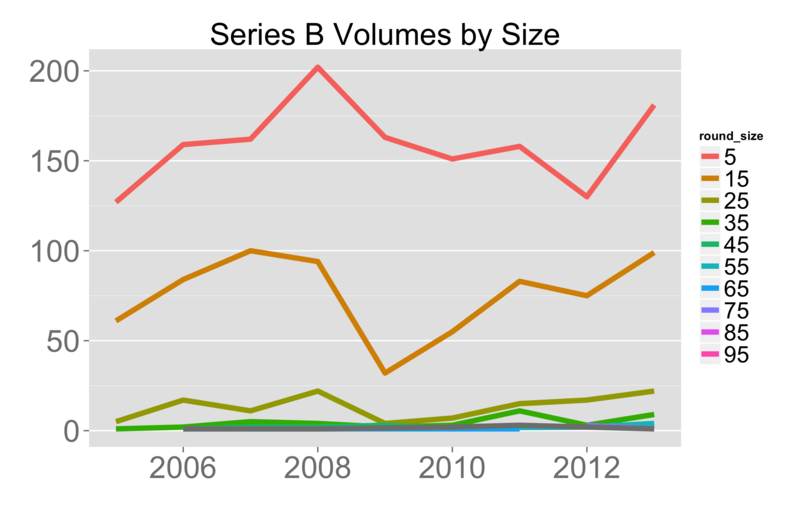 Before 2013, the Series B market was basically flat. Let’s dig one level deeper into the Series As and Bs by round size. The first chart below shows smaller Series As, those with investment sizes under $5M, drive the majority of growth in round volumes. $5-$10M rounds, the brown line, have grown more modestly. Relatively speaking, all other round sizes are flat and irrelevant. The Series B charts by round size tell us that sub $5M Series Bs are also the fastest growing segment, followed by $5 to $15M Series Bs. But the number of $5 to $15M Series Bs hasn’t changed since 2007. Again, larger rounds are largely irrelevant because their numbers are just too small to be significant. Despite the 3x increase in Series A rounds led, the Series B dollars haven’t grown to support an additional 400 startups in the market for a Series B. Needless to say, competition in the Series B market is heating up! I’ll speculate about why this is the case. Perhaps there’s a latency in the market and investors need a few years to seize upon the opportunity. Perhaps there has always been a significant difference in the size of Series B and Series A dollars because the post Series A companies are acquired or fail at a substantial rate. While there has been an enormous expansion of seed funds that catalyze Series A rounds, there has not been an equal expansion in the number of Series B firms, which require larger funds and are harder to raise as a first-time fund manager investor. I’m not sure which is the right answer or if it’s a combination of all of them. In any case, the conclusion is clear. Right now, Series Bs are the hardest rounds to raise. The competition for Series B dollars is about 3x as intense as a few years ago*. Now, more than ever, founders ought to reverse engineer their startup’s Series B pitch to maximize their chances of success. I’m assuming that the rates of company acquisition, company failure and general founder behaviors have remained constant over the past ten years. Unfortunately, it’s hard to prove this point using the Crunchbase data because it’s too noisy.